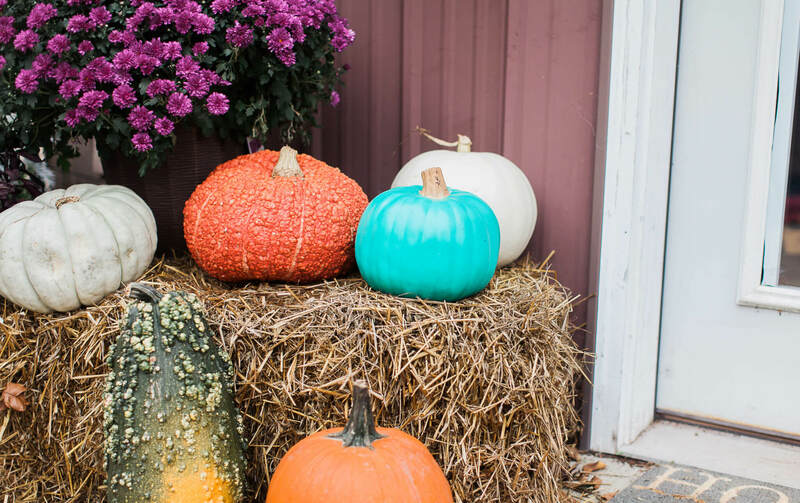 On most doorsteps, you’ll see your traditional orange pumpkins carved and glowing, but every so often you may see a teal pumpkin nestled amongst the decor. The teal pumpkin is a symbol that tells trick or treaters that the home has allergen friendly treat or items available. 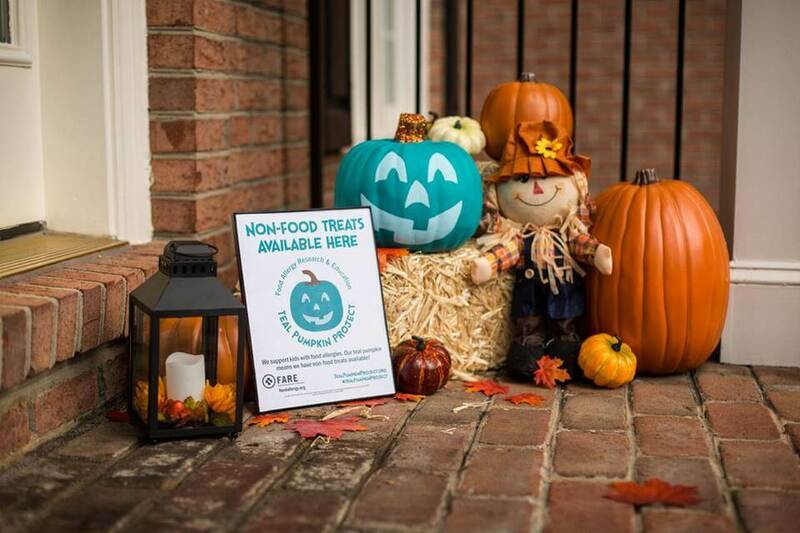 The Teal Pumpkin Project was started by FARE (Food Allergy Research & Education) and aims to raise awareness of food allergies and promote inclusion of all trick-or-treaters throughout the Halloween season. (keep scrolling to learn what kind of allergen friendly treats you can provide this year)! Researchers estimate that up to 15 million Americans have food allergies, including 5.9 million children under age 18. That’s 1 in 13 children or roughly two in every classroom. About 30 percent of children with food allergies are allergic to more than one food. Children with severe and life-threatening food allergies and their families can find it especially hard around the holidays. Children with food allergies are often times overlooked when it comes to food options during special events and holidays, especially at Halloween. And let me tell you – when a family sees the teal pumpkin, it’s like an instant moment of relief…for both the child and the parent. Many traditional Halloween treats aren’t safe for children with food allergies. The Teal Pumpkin Project promotes safety, inclusion, and respect of individuals managing food allergies. This worldwide movement offers an alternative for kids with food allergies, as well as other children for whom candy is not an option. It keeps Halloween a fun, positive experience for all! Also, here are some free signs you can print at home! Below are a handful of steps that you can take to be prepared for those food allergy trick or treating children in your neighborhood. Step 1: Make sure to purchase and prep your teal pumpkin ahead of time! You can purchase one that is already painted, or paint your own. Here are a couple great ones to buy from Target – light up pumpkin or carvable pumpkin. Step 2: Make sure to place your pumpkin in a very visible location – on your front porch or at the entrance to your yard. You can even add your home to the national Teal Pumpkin Project Map – which allows food allergy families the ability to look up homes in their neighborhood or city that accommodates children with food allergies. Step 3: Gather non-food items for trick or treaters. You can find affordable items at your local dollar store or in the $1 bins at many stores. Below is a list of ideas that typically come in packs with multiples inside. And so much more! Get creative and have fun finding little items. Target also has a handful of non-food goodies you can buy and give out! Are there any non-food treats I should avoid? There are a few considerations when choosing which non-food items to hand out. First, some non-food items still contain food allergens, such as some brands of moldable clay, which may contain wheat. Additionally, try to choose latex-free items, as there are children who have latex allergies. What about allergen friendly candies? I bought allergen friendly candies from the health food store in town and it’s the Enjoylife brand. While there are brands out there that sell “allergen-friendly” foods and candies, not all children have the same allergies. While a candy may say “allergen-friendly” a child could STILL have an allergy to an ingredient in the candy. Typically…allergen friendly candies follow a “most of the time” approach…in that most of the time the allergen-friendly candies are safe for most children – but not all. That’s why having non-food items is super helpful and safe – for ALL kiddos. Non-food toys seem expensive. Do I have to buy enough for all trick or treaters? How do I know if the trick or treater has food allergies? Sometimes the child with food allergies will be carrying a teal bucket which will alert you that the child indeed has food allergies. However, if they are not carrying a teal bucket – so long as you have a teal pumpkin out front or a sign, that will alert the child or parent to ask or comment on receiving an allergy friendly/ non-food treat! Sure – just do it safely! The point of the Teal Pumpkin Project is to make trick-or-treating as inclusive as possible. You can keep the experience safe by keeping your food treats and non-food treats in separate bowls. If I’m handing out candy and non-food treats, how do I determine which treat to give to each trick or treater? Do kids really like non-food treats? They don’t just like them, they love them! Finding a unique treat at your house will be a fun surprise. Glow bracelets, for example, are a great option. They are inexpensive, kids can wear them throughout the night, and parents are appreciative because they help make kids more visible after nightfall. Other non-food items, such as pencils and stickers, can be used at home and at school long after the candy has run out or expired.